The children in Oak Class have tried their hand at Golf thanks to a Professional Golf Player and Mrs Sutheran! The Cycle Training Team that we usually book to do our training couldn’t do our usual time in July as they had a crazy amount of booking requests. So we approached another company – Counties Cycling and we booked them for the week of 14th September. Again we have part funded the cost with Sports Premium money and we had much more up take this year. 29 children wanted to part so we extended it by a week to accommodate everyone. This was a good opportunity for the children to achieve a combined level 1 skills and level 2 on-road cycling proficiency certificates. Staff attended training in Gymnastic teaching. A lesson on curling and stretching was taught with the staff acting as the pupils. This was a fun session and hopefully staff learnt enough to give them confidence to teach their own classes next term. Scooter sessions continue to take part for the KS2 children at 1.00 when the infant playground is free. This is done on a rota system. Also sessions of dodgeball, hockey, skipping, hula hoops, circle games, basketball, blanket ball, ten pin bowling, speed stacks, cat’s cradle and double Dutch skipping have been led for both Key stages. Rising Stars have now included the Reception classes into their programme so now all years receive one PE session per week from this outside agency. Mr. Mac has been teaching Basic skills, Rugby and Dance during this Autumn Term. He has also started a gymnastic club and a fencing club. This club started up again in January thanks to Mrs. Sutheran and is helped by Mrs.Doddridge. Several children that used to attend came along plus others that were especially invited. They will be using the Creative Bag supplied by Change4Life through A10 Active. They have already taken part in some fun activities. Please watch this space for some action photos taken by Mr. Rignall. On the afternoon of Thursday 21st January eight Yr 6 children were given the opportunity to attend a water sports festival at Turnford School. They took part in water sports related activities not involving water!!!!!!! There were different activities set up in their hall ready for us with lots of young sports students there to help. One activity related to water polo, another canoeing, one water volleyball and on the stage there were rowing machines set up which the children were very keen to use! Our children did very well at an aiming game with the help of tactics suggested by Mr. Douglas. Here are some photographs from the event. 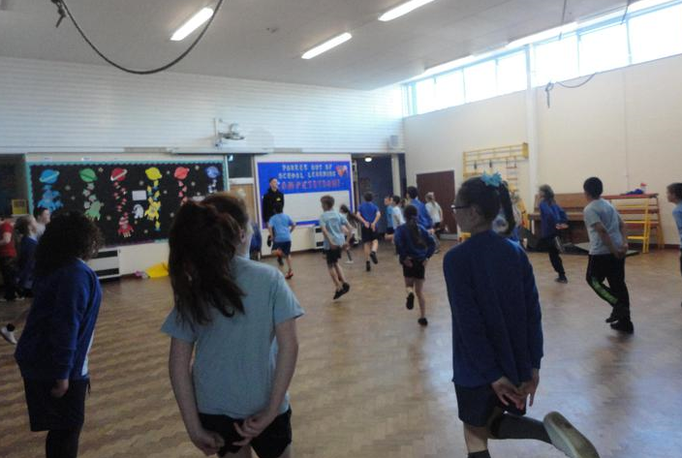 "It was fun and I enjoyed working together"
" It was fun but scary"
"I loved the 3:6:3 best"
" I enjoyed the team game "
On the 21st April Marcia , Jayne and their helper from A10 came into school to deliver a session on indoor athletics to the three Yr 5/6 classes. A range of different athletics activities were set up for the children to take part in. After an energetic warm up they participated in speed bounce and balance beam, then hop, skip and jump( triple jump) followed by a standing long jump. Lots of coaching tips were given during this session and all the children improved their Athletic skills. Some children were noted for inclusion in District Sports which will take place in July. After a successful 2 years we have again organised (through Eddie Ballard -Hertfordshire Cricket Consultant) for a coach to come in June . We have committed to him coming every Tuesday morning for 6 weeks. This will consist of 3 curriculum sessions with Year 5/6 children. 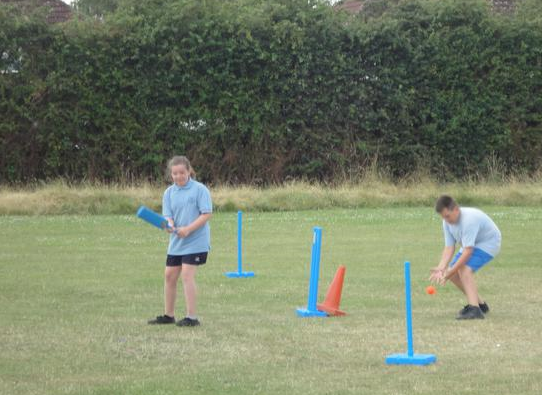 The children really benefit from these sessions as they develop good cricket skills; they are encouraged to join local cricket clubs and are given links to do so. We hope to enter the A10 under 11 mixed cricket tournament and the District Kwik Cricket Tournament this year.